With a nickname like "Skywalker," if you're not rolling around campus with a lightsaber by your side, you better have some hops to back it up. 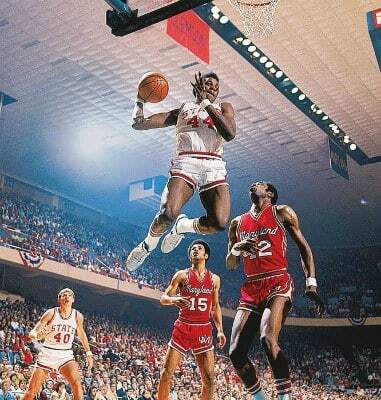 Sporting a 44-inch vertical, David Thompson is rumored to have started a trend that still goes on till this day: the alley-oop. Along with his teammate at North Carolina State Monte Towe, the two implemented the oop into their team's game plan and took advantage of the competition in the process. In his ABA days with the Virginia Squires, Thompson fell out of the spotlight when he was overshadowed by fellow 1976 Slam Dunk contestant, Julius Erving. Many believe that Skywalker attempted a dunk during warm-ups called "cradle the baby" (sound familiar?) but never did it during the competition.